BILLINGS, Montana, July 2, 2011 (ENS) – An ExxonMobil pipeline running under the Yellowstone River in south central Montana burst Friday night, spilling black crude oil rushing into the river and forcing residents downstream to evacuate. 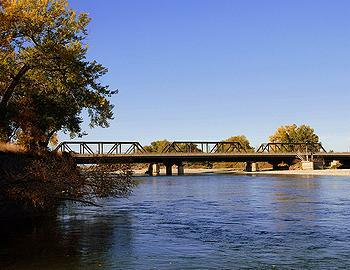 The rupture occured in a pipeline at Riverside Park near Laurel, a town of about 6,500 people about 10 miles west of Billings. For fear of an explosion, officials in Laurel evacuated about 140 people on Saturday shortly after midnight, then permitted them to return at 4 am once tests showed fumes from the leaked oil had dispersed. The oil spill comes after the swollen Yellowstone River overtopped its banks Saturday, flooding Riverside Park and closing a county road south of the Laurel. An ExxonMobil official said the damaged pipe is buried six feet below the riverbed. The park has been closed for since late May because of high water and flooding. ExxonMobil has activated its North American Regional Response Team out of Houston, Texas to assist in the clean up efforts. On Saturday, cleanup crews in Laurel placed absorbent sheets along the banks of the river to sop up the oil, and measured fumes to determine the health threat to local residents. The Billings Water Department closed its intake line from the river late Friday night when the pipeline break was first reported. Crews there tested the water all night and found it to be safe, because, officials said, oil floats and the intake lines draw drinking water from near the river bottom. They reopened the intake lines early Saturday, officials said. The U.S. Environmental Protection Agency has sent a crew from Denver to monitor the cleanup. The Montana state Department of Environmental Quality and the Montana Department of Fish, Wildlife and Parks will monitor Exxon’s cleanup effort.